Choosing the right siding for your new home is important: You need a material that will stand up against the weather that Colorado has to offer, as well as an option that is easy to keep up and maintain. Here are five things you need to consider as you look through your home siding options. You need to make sure your choice is water resistant, especially in Colorado. With the many freezes and melts we experience, it’s essential that your home siding choice is very water resistant. Discuss the energy-efficiency of your siding choice with your siding expert at Gravina’s Windows & Siding. Check the R-value rating for the best energy savings, and also discuss the insulation beneath it as well for the best efficiency. Discuss the exterior of your home with your siding expert, to make sure it is versatile enough to work with every area of your home. There are areas of a home’s exterior that may not work well with a particular type of siding – it’s best to know what to expect before you start your project. Choose a home siding option that will stand the test of time. You need a material that will handle the temperature shifts that Colorado has to offer, and will last for years, so you don’t have to worry about replacing it for a long time. 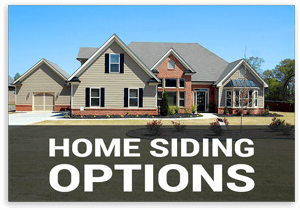 As you pursue home siding options, be sure you choose something that catches your eye. It is your home, after all, and aesthetics matter. Choose something that you love, because you’ll see it constantly as you come and go from your home. If you’re looking for home siding options, or need replacement siding, don’t hesitate to contact the experts at Gravina’s Windows and Siding. We are proud to put our name on the job, and our workmanship is unsurpassed. Give us a call at 303-472-8462 to learn more. We are located 3 blocks west of Santa Fe, at 950 W Evans Drive, Denver, CO, 80223.